As I said earlier, I went home this weekend. (thanks for the photo for today, Paul!) Chad was going out of town, and asked me to drive up and cover the service FOH duties for him. I gladly accepted, on the condition that Chetley would be in attendance. Chet and I took care of it, and the service ended up turning out great. Chetley did all the dirty work down on stage, leaving me with buttons to push and knobs to turn, to my heart's desire. With him covering everything, I get to do what I'm there to do, mix audio. Audio mixing is considered an art form by many. In the same way that a symphony conductor communicates more and less sound from his instruments. 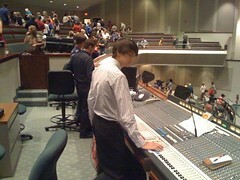 From the soundboard position, the audio engineer is essentially a conductor of instruments. A conductor points to a section of french horns for more sound. An engineer turns up a fader. The same respect that I give conductors, I give to audio engineers. A good engineer is better than a good conductor. The "sound" of a group can be controlled by a conductor, of course. However, when the venue grows to large for the group to fill naturally, the sound must be enforced. Sound Reinforcement is what live audio is all about. To reproduce, in as true of a form as possible, the sounds that you would normally experience, for every person in the audience to feel as if they are getting a personal concert. The service went great, thanks to Rick Mangrum behind the wheel. If Ken needs to skip town for any reason, he can always count on Rick to cover the bases for him, loaded or not. Thanks a lot, Rick, for always understanding my side of things, and being understanding of the media team. I missed seeing the Gautier family this week. They were camping. I got to see Dave, Paul and Kerry though. My media family, all together again. Hopefully Chad will get to come down this weekend, and see the dorm!